Have you made Bourbon Pecan Truffles? 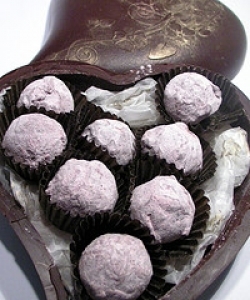 1. from the book Chocolate Truffles by Carrie Huber. 2. 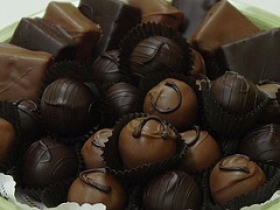 Making the Ganache: To prepare ganache, chop or grate chocolate into small pieces. 3. Place in top half of double boiler along with cream. 4. Put hot (not boiling) water in bottom half of a double boiler, making sure the water doesn't touch the top pan. 5. Stir often with wooden spoon. When all of the chocolate has melted, beat until well combined. 6. Remove from heat, let cool to room temperature. 7. Transfer to covered bowl and refrigerate overnight to harden. 8. (Ganache will keep in this state for a few days if necessary). 9. Take a little ganache at a time and form 1" balls, using fingertips (with as little contact as possible so the chocolate doesn't soften). 10. 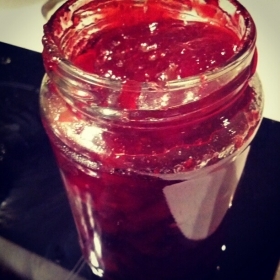 Keep unused portion refrigerated as you work. 11. 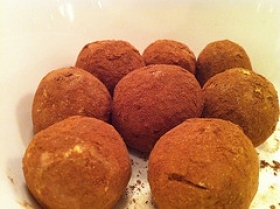 Place balls on waxed paper-lined baking sheet; continue until ganache is used up. 12. Refrigerate baking sheet until ganache is hardened, overnight or up to two days. 13. 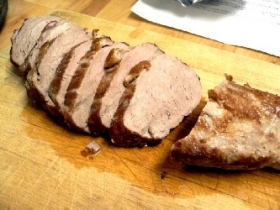 Allow to set in refrigerator at least two hours before loosely covering with waxed paper. 14. Foil can be substituted in all cases for waxed paper, but never use clear plastic wrap. 15. It clings too tightly to the candies and traps moisture inside which discolors the chocolate. 16. Prepare Chocolate Coating: Chop or grate chocolate into small pieces. 17. Heat chocolate and oil together in top of double boiler over hot water, stirring until smooth with a wooden spoon. 18. Insert candy thermometer and begin dipping the ganache balls when temperature registers between 85-90F If chocolate begins to cool and thicken before you're finished dipping, reheat over hot water. 19. Work with only 1/2 dozen at a time, keeping the rest refrigerated. 20. Drop a single ganache ball into the chocolate, turning to coat well, then lift it with the fork. 21. Allow excess chocolate to drip back into pan, then gently rap fork against edge of pan to remove more chocolate from ball. 22. Failure to do this will cause a large dribbly "platform" or "skirt" to form around the base of each hardened truffle. 23. (this makes it difficult to pack them side by side in a box). 24. There are two schools of thoughts as to the proper method of depositing truffles onto the baking sheet: A) If you are conservative by nature it's best to gently slide them off the fork with a butterknife, onto the waiting baking sheet. 25. B) If you intend to further decorate the truffle, the second method, (for the show-offs among us) involves dropping the truffle off the fork upside down directly onto the baking sheet. 26. Quickly manipulate the single strand of chocolate, adhering to the fork, into some glorious shape atop the candy, like the pros do. 27. Either way is acceptable, although the second way requires some practice and an accurate thermometer to get it right. 28. If your chocolate temperature is off by a few degrees, you're likely to find a chocolate highway - not a chocolate strand - adhering to the fork when that critical moment comes. 29. The perfect finale for the basic recipes, for instance, is a sprinkling of shaved dark chocolate over the top, or better yet, gently rolling each newly-dipped truffle in the shavings to coat completely. 30. 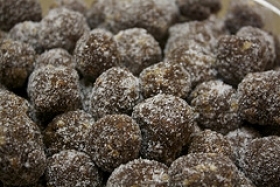 Refrigerate all truffles after dipping several hours or overnight to harden. 31. When ganache has cooled to room temperature, fold in bourbon and chopped pecans before refrigerating. 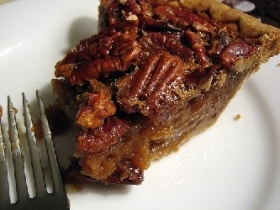 This recipe contains potential food allergens and will effect people with Alcohol, Pecan allergies.